GSMArena team, 16 November 2011. Samsung has managed to fit the Galaxy Note in a surprisingly compact box - just a few millimeters larger than the device itself. The bundle includes a charger, a one-piece headset, a microUSB cable and a quick start guide. That’s all the basics covered, considering that the device offers ample storage out of the box. The bad news is that the MHL adapter required for HD TV-out and the USB adapter enabling the USB host functionality aren’t included. It’s a real pity – both work pretty well but many users will probably not bother purchasing them and won’t get a chance to try them. At 146.9 x 83 x 9.7 mm the Samsung Galaxy Note is not your ordinary smartphone. Samsung have done well to keep the waistline so slim. Big devices are extremely sensitive to that kind of thing. The Galaxy Note is huge but not the solid muscular type. The slim body and massive screen have a sense of fragility about them, lacking physical strength. At 178 g it’s lighter than you’d expect - the Note is just 10 grams heavier than an Optimus 3D. Samsung went for simplicity with the Galaxy Note's design and that seems like a pretty good idea. There's nothing even remotely subtle about a 5.3” device and going all fancy on the finishing would have probably pushed things a bit too far. You get the patterned back that we’ve come to know and like from the Galaxy S II only this time it’s in dark blue (so dark, it’s as good as black). It has little to do with providing extra grip. A device this size is much harder than usual to handle and the texture of the battery cover can do little to fix that. And knowing how much it costs, you really wouldn’t want to drop it. The Note has a metal frame running all around the sides and a front panel with a single control – the hardware home key. Of course, that’s the only thing to notice with the screen turned off. Once you power it on, it will easily get all the attention. The Samsung Galaxy Note N7000 features a 5.3” Super AMOLED screen of WXGA resolution. That’s right – we are talking 1280 x 800 pixels of unmatched contrast on the largest AMOLED screen on the market (a title the Galaxy Tab 7.7 is soon to claim for itself). Super AMOLEDs were impressive enough on a smaller scale, but this one is spectacular. Having mentioned the specs, we hardly need to go on and on about the image quality. With a pixel density of about 285ppi and infinite contrast, the huge AMOLED is a joy to behold. Brightness levels are adequate (though they aren’t a Super AMOLED forte to begin with) and we have the typically flawless outdoor performance. Everything remains perfectly legible on the Note's display, no matter how bright the sun is. Viewing angles are also top notch - it almost feels the icons are painted on the top of the glass. Like the other recent AMOLEDs by Samsung, the Note display has a setting for the color saturation. You can choose between the super punchy but not quite real colors and a more natural look. The only downside of the 5.3” screen is that, unlike its Super AMOLED Plus siblings, it uses a PenTile matrix, instead of a conventional RGB one. 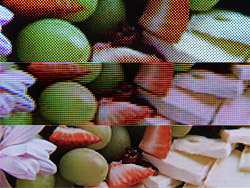 It means that each pixel is composed of two, rather than three subpixels, which lowers the effective resolution whenever subpixel rendering is used. However, with the Galaxy Note having so many pixels the infamous dotiness is much harder to spot. Basically, you'll need to look from a much shorter distance than what feels comfortable for working with the smartphone. Bottom line is that with that kind of pixel density, PenTile makes much less difference. Finally, here comes our traditional display brightness test, which confirms that the Galaxy Note Super AMOLED is only slightly brighter than the Samsung Galaxy S II. It’s the infinity scores in the third and sixth columns that matter the most, though.